Summers in New York bring outdoor events, kayaking, BBQs and street festivals. However, the 100 degree heat, paired with brick and asphalt can wear on even the staunchest urbanite. While there are many campgrounds that offer an escape close to New York City – in the Poconos and the Adirondacks – they are hard to get to without a car. Luckily, there are more and more camping options accessible by public transit. A few months ago, we wrote about President Obama’s Great Outdoors Initiative. Expanding on this initiative, Interior Secretary Ken Salazar announced a plan to create the largest urban campground in America right here in New York City. 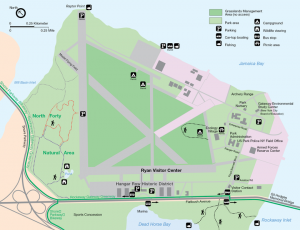 The plan is to enlarge an existing camping area in Floyd Bennett Field from 5 campsites to 90 within the next two years – and up to 600 sites at completion. The Christian Science Monitor reports that the Gateway National Recreation Area will host free camping workshops this summer tailored to multigenerational families in Floyd Bennett Field, to promote the growing campsite. Further, the park service may also send staff to low-income communities to encourage visits to the campground. Floyd Bennett Field was opened as New York City’s first municipal airport on May 23, 1931. Between 1931 and 1939 it became the site for a number of record breaking flights. When Municipal Airport #2, now known as LaGuardia Airport, opened in 1939, the city sold Floyd Bennett Field to the U.S. Navy. Floyd Bennett Field was active through WWII, the Korean War and Vietnam. When the U.S. scaled back the Vietnam War in 1971, the U.S. Navy deactivated the Field. Soon thereafter, the National Park Service made the location part of Gateway National Recreational Area. Today, in addition to camping, Floyd Bennett Field features bike routes, bird watch opportunities, and Brooklyn’s largest community garden. As New Yorkers look for frugal vacation options and become more environmentally aware, the expansion of urban camping facilities is quite timely. The city has been struggling to meet the demand for urban campgrounds. For example, the NYC Parks Department runs a Family Camping program Friday and Saturday nights in July and August. Families can join the Urban Park Rangers for a free camping experience in parks across the five boroughs. The program features a cookout, then a variety of evening activities, such as stargazing and night hikes. In order to be able to participate in the Family Camping program, you have to enter your name into a lottery. Each park generally has about 30 coveted spots and registration is open for only one day per site.